Weathervane by Frank Adams. New exhibit at museum opens Thursday and runs through February. 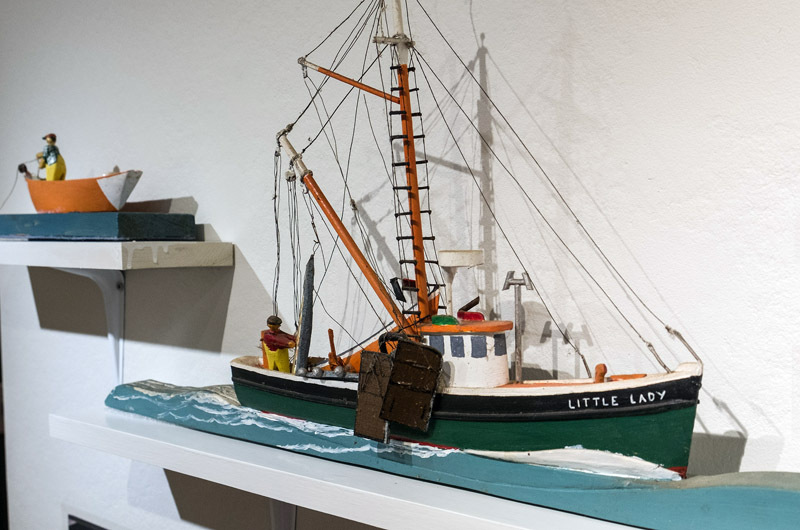 Jimmy and Roberta Morgan’s house in Chilmark is filled with art — much of it their own, including the hand-carved fishing scenes that have become a mainstay in the Vineyard folk-art tradition. Originally made as weathervanes, the slender, wooden depictions of Islanders at sea now adorn many homes on and off the Island. In a recent interview with the Gazette, Mr. Morgan recalled carving blocks of wood into simple ships as a kid and dragging them by a string around Menemsha Harbor. Later, he continued to find his calling in the sea. “I would have quit school to go fishing, but my mother wouldn’t let me,” he said. It was only a matter of time before he was out of school and running draggers and swordfishing out of Menemsha — a long career on the water that sprouted a decades-long passion for woodworking. 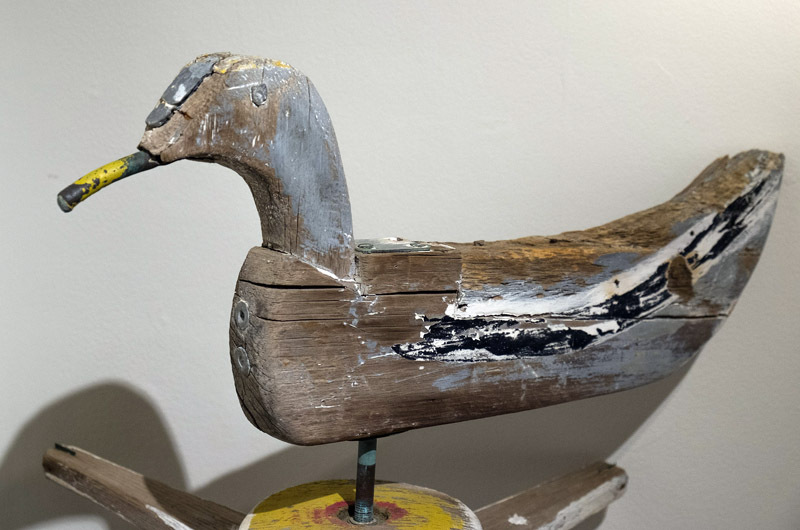 A new exhibit at the Martha’s Vineyard Museum, Windblown: Weathervanes from the Museum’s Collection, features several of Mr. Morgan’s fishing scenes, along with historic weathervanes in the shape of sailboats by Frank Adams and George Tait, photographs and other objects from the collection. 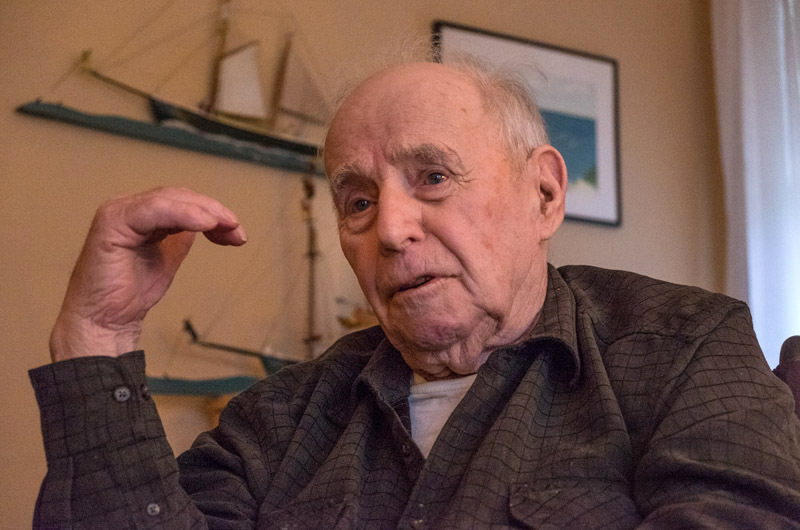 “They aren’t weathervanes,” Mr. Morgan says of his carvings, which have multiplied in value in the decades since Mrs. Morgan began selling them at her Harbor Crafts Shop in Menemsha. “What happened was I started making the weathervanes, and then people didn’t want them as weathervanes,” he said. “They wanted them to hang on the wall.” He pointed over his shoulder at a few on his own wall, including a version of the Roann, a famous wooden dragger now owned by Mystic Seaport. After the shop opened, he became devoted to his craft, often disappearing into the basement for long shifts at the workbench. “He loved going downstairs, working on them,” said Mrs. Morgan. “I could hear him singing. This is his sanctuary.” His elaborate scenes were often complete with crews, painted waves and wire rigging. 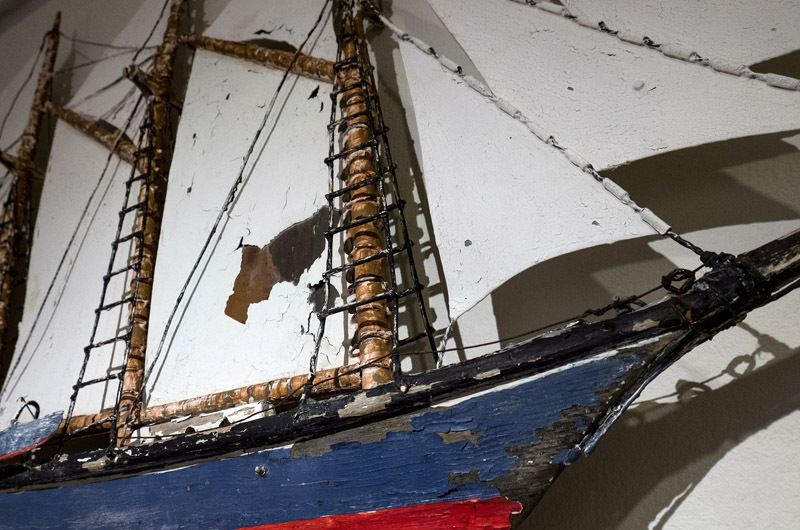 The ones on display at the museum depict a number of familiar boats — Little Lady, Christine and Dan, Three Bells, Dorothy and Everett and others — accompanied by recordings from the museum’s oral history center, which has helped document Mr. Morgan’s life as a commercial fisherman. “I’ve seen the best of it,” Mr. Morgan said of the industry, which has declined greatly as a result of overfishing and government regulation since the 1990s. Along with the fishing boats, he also carved a number of swordfish weathervanes, although those are not included in the exhibit. The fishing boats are not precisely to scale, he said, although many have the same colors, rigging and perhaps even crew members as the originals. “We are assuming that all of these people that are on these boats were most likely real people,” museum curator Anna Barber said, adding that the carvings represent folk art in general, where items that once served a mostly functional purpose become more decorative as needs change and artists adapt to the market. She pointed out that the more historic models in the exhibit have clearly taken a beating as functional weathervanes, and now, ironically, have become untouchable works of art. But around the Island, weathervanes continue to appear atop houses and businesses, often providing a personal or humorous touch: a whale here, a cow there, a pterodactyl returning home with its human prey (an homage to the 1966 film One Million Years B.C.). 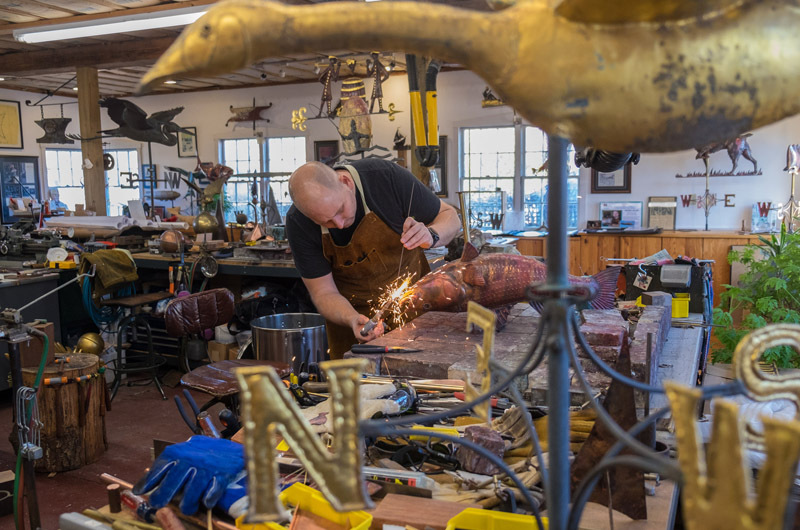 At Tuck and Holand Metal Sculptors in Vineyard Haven, where many of these creations originate, Anthony Holand fires up his torch and blasts a small sheet of copper until it glows red. He picks it up with a pair of pliers and dunks it in a pail of water with a short hiss. After heating and cooling, the copper turns dark grey with red streaks, and becomes much easier to shape — into mermaids, whales, birds, dogs and just about anything a client might ask for. Tuck and Holand is also a sort of hall of fame for Island mascots: a whale made for the bandstand in Oak Bluffs, a blue heron from Blue Heron Farm in Chilmark, the ferry Nobska from the Steamship Authority wharf, also in Oak Bluffs, and of course a sketch for the classic Jaws weathervane, which launched the studio in 1974 when it was commissioned for the film. Mr. Holand will speak Thursday at a reception for the museum exhibit, which occupies the Spotlight Gallery, used for highlighting seldom-seen objects in the collection. As with Mr. Morgan, he noted a changing market for his work. “Half of what I make now ends up indoors,” he said, adding that his clients have increasingly asked for larger and more complicated works, in part because houses themselves have gotten larger. (Some of his recent work includes scenes from the books Where the Wild Things Are and In the Night Kitchen.) But there appears to be no shortage of demand, even in the age of the internet where weather reports are available anywhere at the tap of a finger. Mr. Holand said his two-year wait list has remained full for 20 years. “There is this kind of renaissance in the playfulness,” said Mrs. Barber. “It’s a way to put a personal touch on your house without making it strange or distracting.” And for businesses, she added, a unique weathervane may serve as a sort of identifier or advertisement. “It still serves as this connecting piece to the past,” she said. The museum currently has no weathervane of its own, although Mrs. Barber expected that to change in light of its plans to relocate to the former Marine Hospital in Vineyard Haven next year. She couldn’t guess what it would be, although she agreed it would have to be large to fit the scale. “That would be a tough one to decide,” she said. Windblown: Weathervanes from the Museum’s Collection will show through February, with an opening reception Thursday, Feb. 2, from 4 to 6 p.m. Admission is free. A very interesting article. Would love to attend the Thursday lecture. Thank you for this article. I will miss the opening, but hope to get to see the exhibit. I'm proud to have one of Jimmy Morgan's models on my wall and prouder to know him! I am currently repairing/restoring a Tom Maley Weather Vane. It is Icarus flying too close to the sun. It has been very interesting working on Tom's piece. Working closely on it I feel like I am getting a better understanding of Tom and his work. Makes me remember the times I hung out behind the Field Gallery talking and watching Tom work. He was such a cheerful fun loving guy and it shows in his work. He definitely influenced me and my work. Anthony is creating the classical weathervanes today that will be appreciated today and for many years to come blowing in the wind.